One of the best exercises we give to help combat time at your desk or in front of a screen at home is the SCM squeeze. 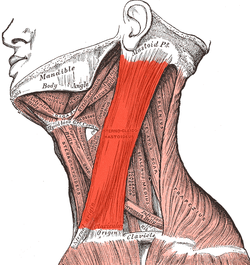 It stands for sternocleidomastoid, the chuncky long muscle you can see if you trace it from both ears to your sternum. It's job is to turn your head to the opposite side. If you turn your head to your left now and feel the right hand side of your neck can you feel it sticking out slightly? You've got it! It also has the role of flexing your neck forward so we kind of need it to be working as best it can so we can carry on going about our day with no pain. Below is a 60 second video explaining how to squeeze this muscle to encourage relaxation and reduce the tension. Let us know how you find it by posting in the comments below.